By Raymond Britt -- What finish time do you need to qualify for Kona? 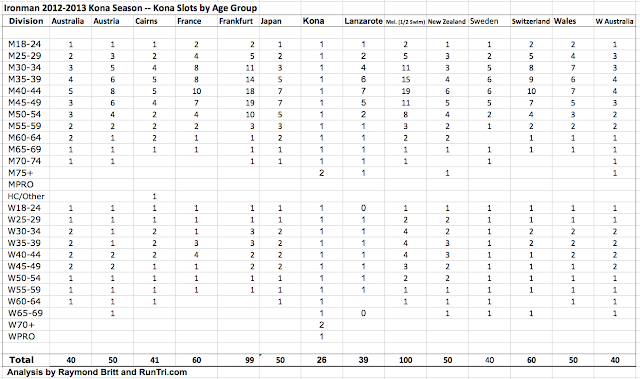 It depends on the race you choose, your age group, the number of Kona slots allocated to your age group. 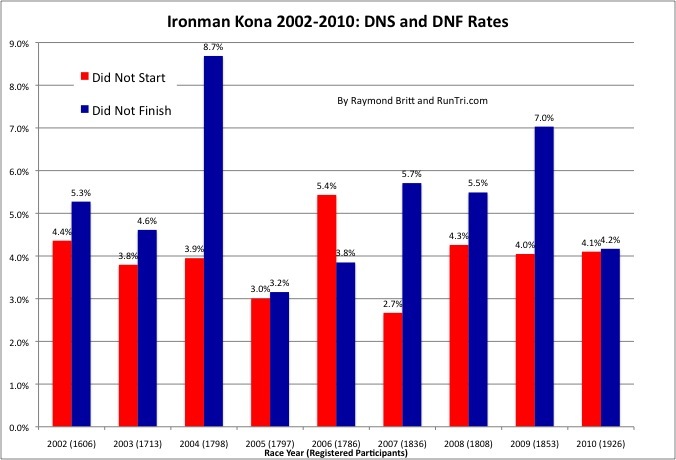 Because Ironman races can vary significantly in terms of difficulty, Kona qualifying times can vary widely by race as well. 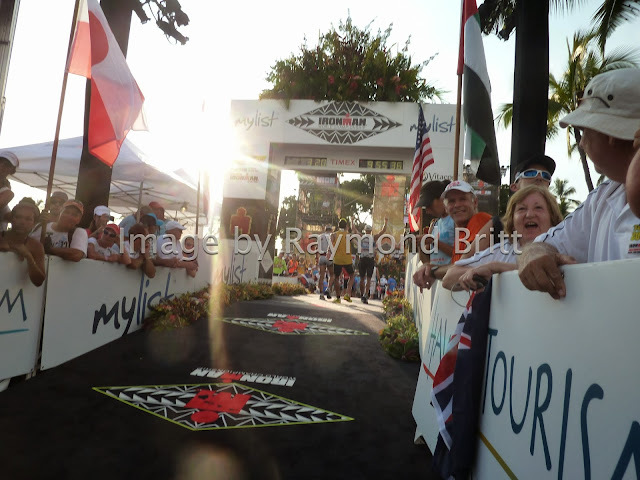 More than 2000 athletes register for the Ironman Triathlon World Championship in Kona, Hawaii. For most, it's an incredible feat to earn the right to race in Kona. 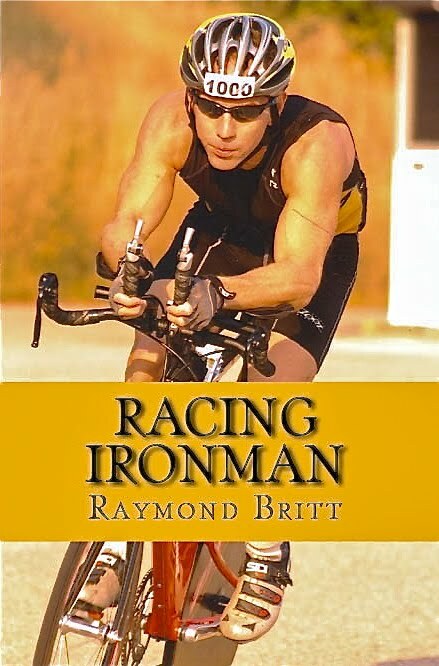 Of more than 75,000 competitors in 30 Ironman races and 6 Ironman 70.3 events, only about 1800, or 2.5%, will qualify to race with the best of the best, in Ironman's premier championship race. 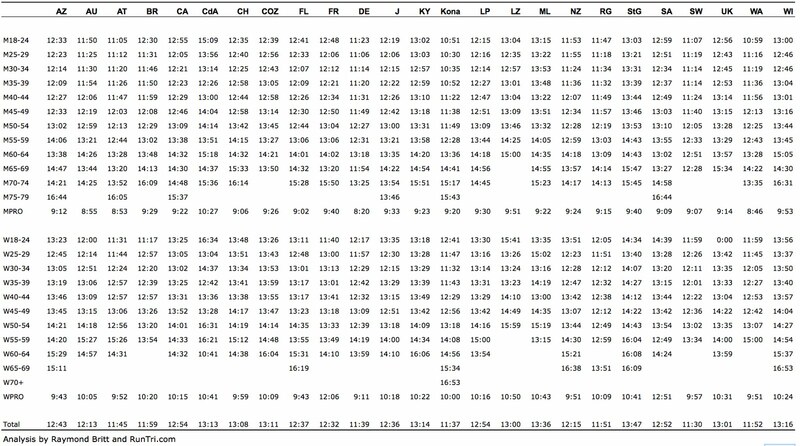 We're not sure why the World Triathlon Corporation (an excellent and inspiring team that I'm privileged to consult for) has decided to keep many results private. So we publish here Kona qualifying Times, Slots, and Change in Qualifying Times for the select races willing to share their results. 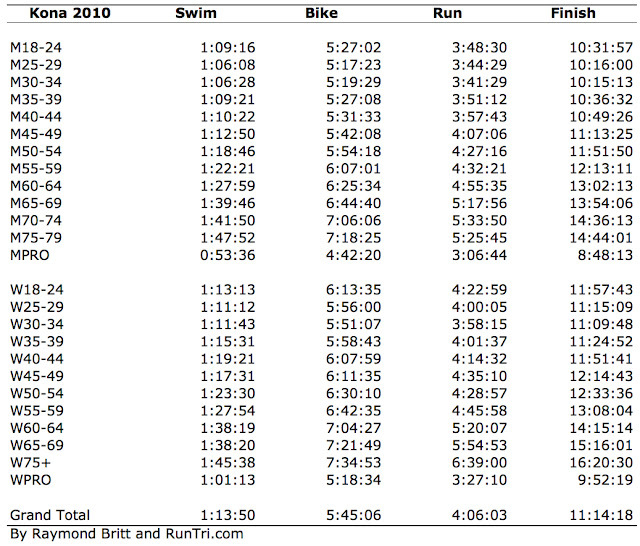 Some terrific performances in these races, and congratulations to all qualifiers. 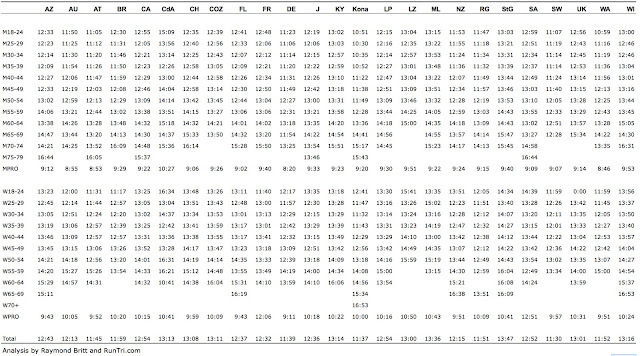 For complete qualifying times for 2011 and 2010, they are further down this post. 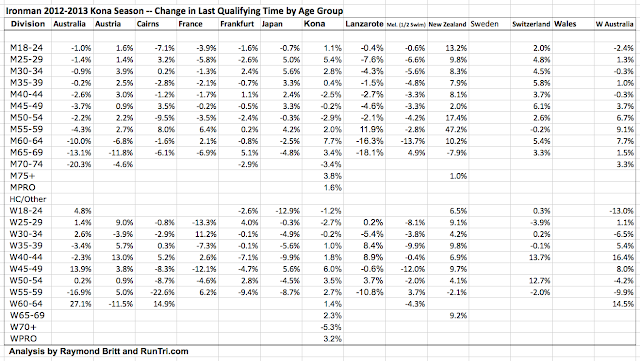 The biggest challenge of all: qualifying times are getting faster, in most age groups and most events. On average, qualifying times dropped around 2%this year. 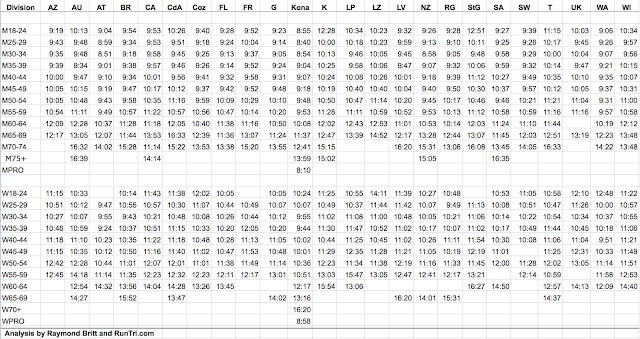 That means for example, if it took 10 hours and 30 minutes to qualify in your age group, that 2% improvement means you'll need to finish 13 minutes faster to qualify next year. 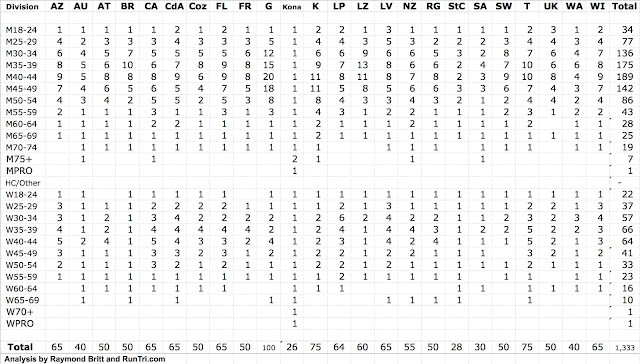 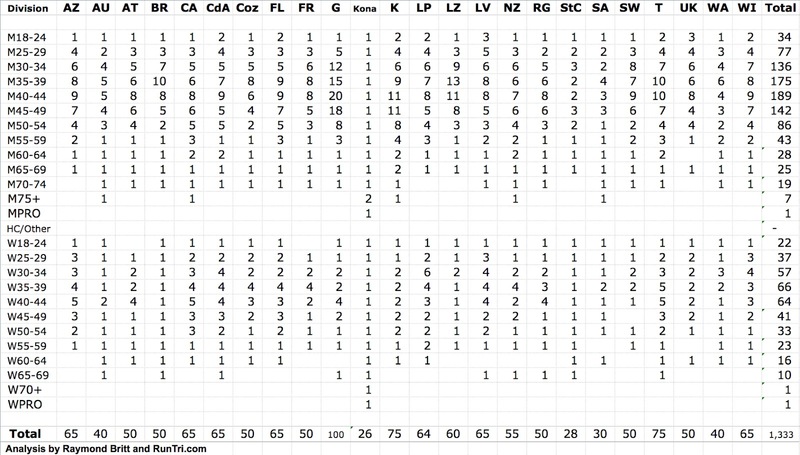 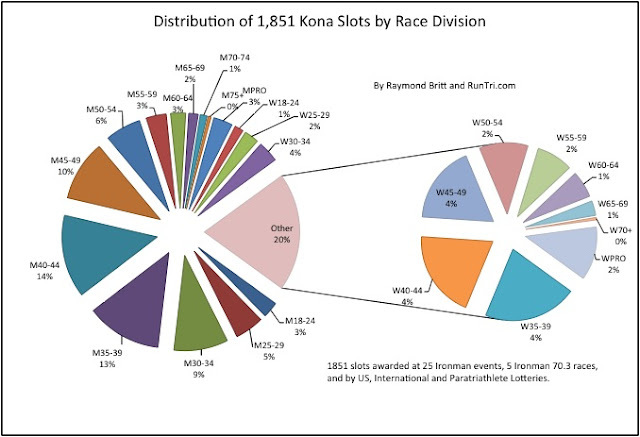 In previous years, we presented complete Kona Qualifying Times and Slots comparisons for all Ironman Triathlons in 2011 with some updates for 2012. 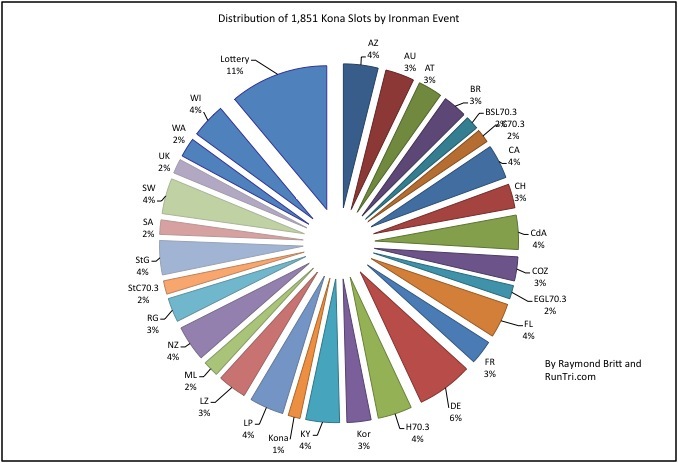 In preparing the analysis for those posts, we were able to access data for all events. 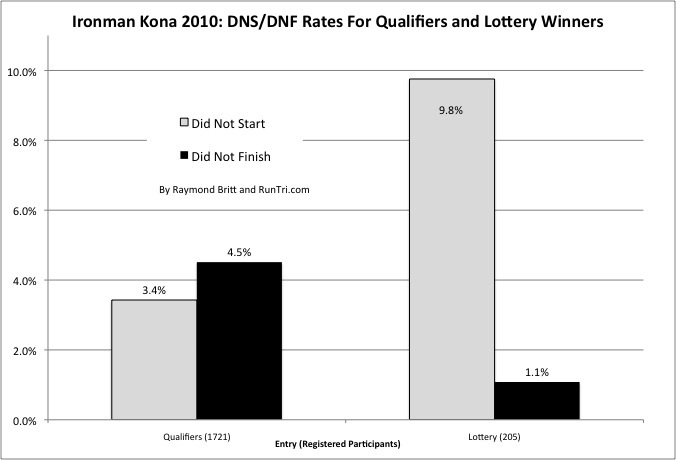 Unfortunately, this year Kona Qualifying results have not been released for most races on the calendar. Some European and Asia/Pac events proudly shared Kona results; all North American races did not. 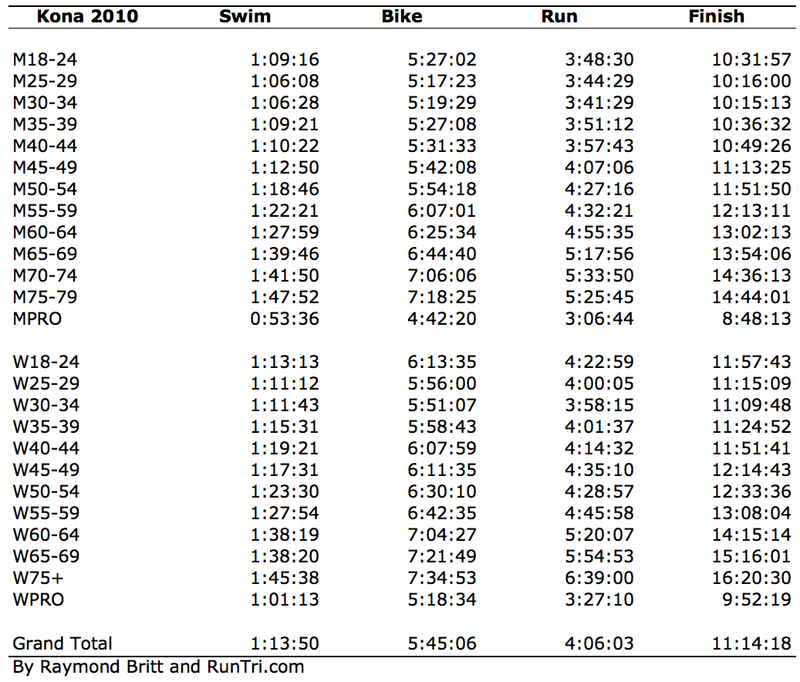 This table outlines 2010 qualifying times for the last qualifier in each division across 25 of the best Ironman triathlons in the world. 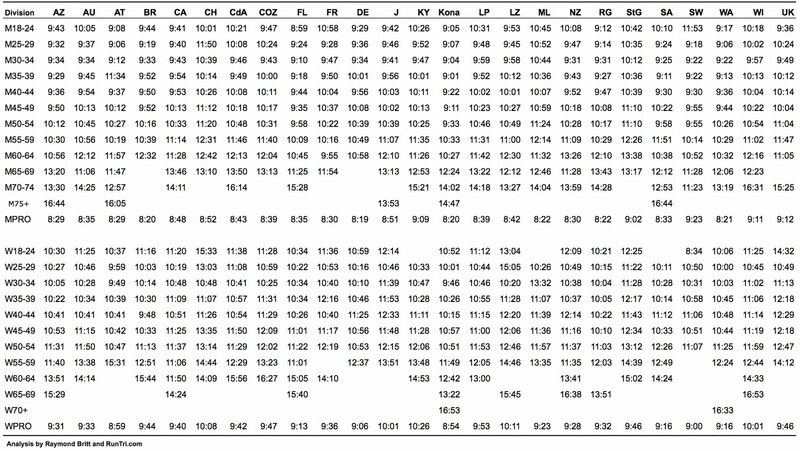 If you want to have a chance to qualify for Kona in one of these races, expect that you'll need to be at least as fast as the time in your division on this table. 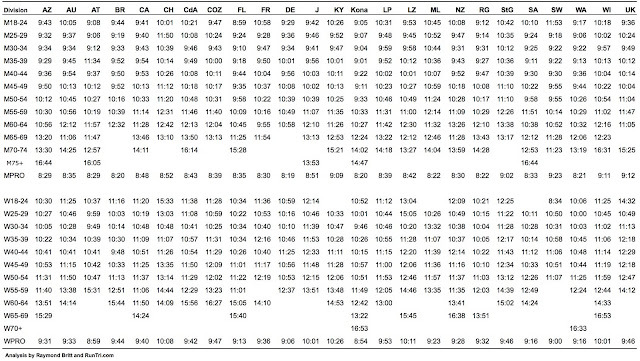 Probably faster; qualifying times get faster every year. 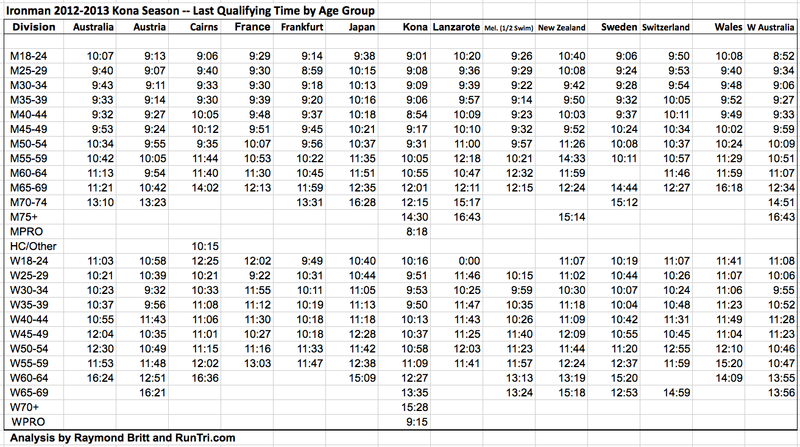 See the complete list of Qualifiers and Finish Times by Race and Age Group for complete details. 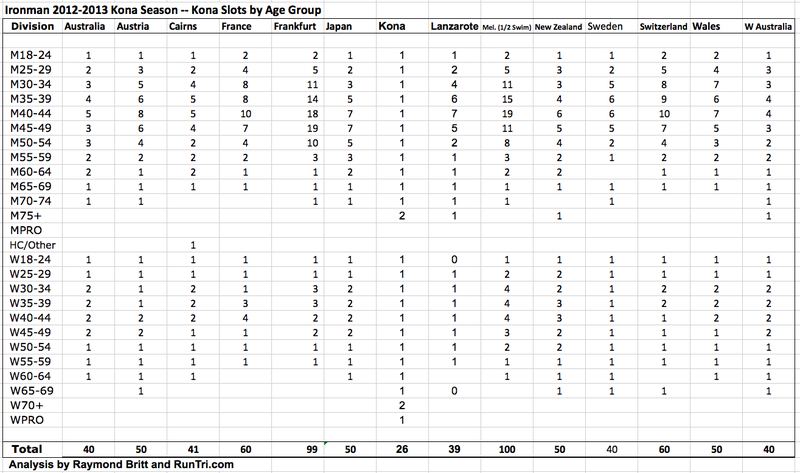 Also see our Analysis of Kona Slots per Age Group and our Allocation of Kona Slots by Event and Age Group graphs. 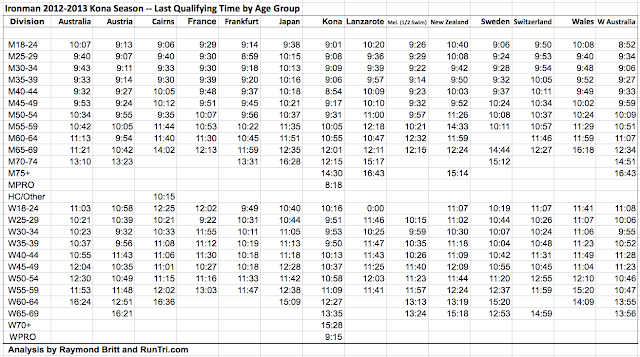 How do Kona qualifying times compare with average times by age group across all 25 races? 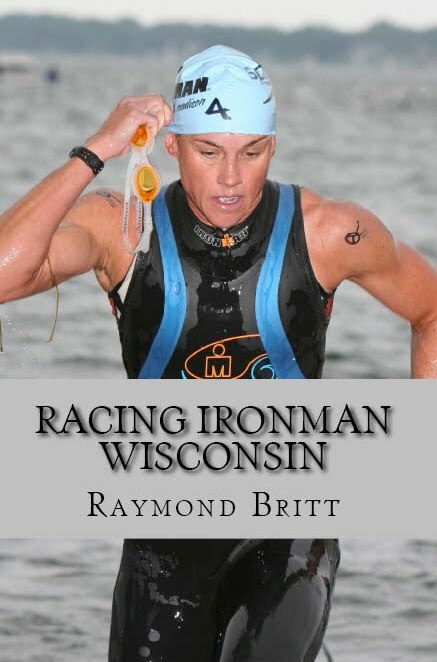 Runner or Triathlete? 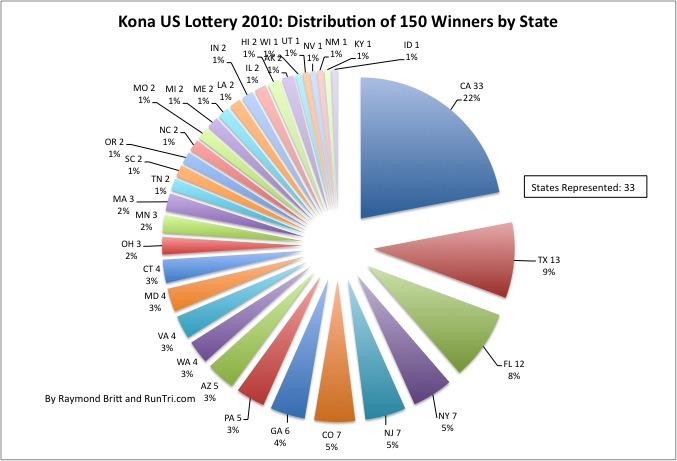 Why Not Both? 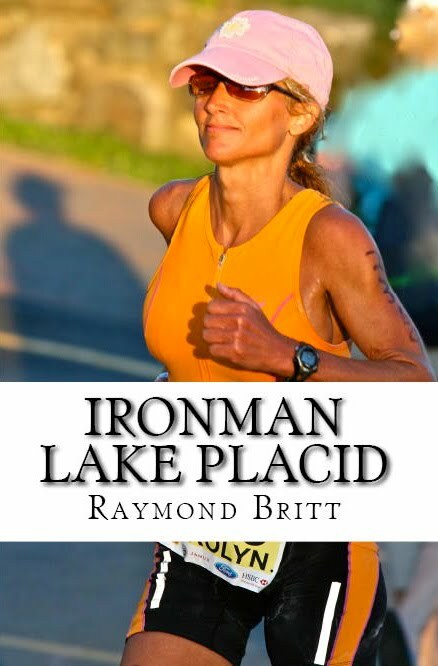 For advice and guidance, see our complete Complete Kona Coverage, and our book Qualifying for Kona.